Purpose: This pilot study compared the effectiveness of plaque removal of two manual toothbrushes; a novel toothbrush design and a control reference toothbrush. Methods: Thirty-eight individuals meeting specific criteria consented to participate and were randomly assigned to one of two groups. Subjects were given both study toothbrushes eight days prior to data collection to use on alternate days for two minutes twice daily for familiarization. Subjects refrained from any oral hygiene procedures for twenty-four hours prior to data collection at which time a baseline plaque score was recorded using the O'Leary Plaque Control Record. Following the baseline plaque score recording, timed brushing was supervised by a research assistant, using a split mouth design, followed by a post-brushing plaque score. All plaque scores were recorded by the same examiner blinded to group assignment. Pre- and post-brushing scores were compared using t-tests and analysis of variance (ANOVA) to determine differences. Subjects also completed a qualitative survey on the two brushes. Results: When compared to overall plaque scores, no significant differences were shown between the two brushes or when compared to all interproximal surfaces, all smooth surfaces and left vs. right sides. Both brushes performed better on the left side. The control brush was slightly more effective than the novel brush in the mandible (p=0.0222) and on lingual (p=0.0169) surfaces. Results of the survey showed that the subjects significantly favored the novel brush. Conclusion: Both brushes were effective, although the reference brush was slightly more effective in plaque removal than the novel design brush in the mandible and on lingual surfaces; however, the novel brush was preferred by participants. Plaque biofilm accumulation in the oral cavity is an essential etiologic factor of caries and gingivitis and plaque removal with a toothbrush has been shown to reverse the process of gingivitis.1 The primary factors identified influencing the ability to remove plaque with a toothbrush are: length of time and frequency of brushing; the individual's brushing ability; and toothbrush design.2 Numerous toothbrush designs, featuring a variety of bristle, head, and handle styles, have been developed to assist the user in simpler and more effective plaque removal. Some studies comparing novel toothbrush designs have shown that the new designs removed plaque more effectively than a standard design,12,13 while other studies comparing novel designs to standard designs do not demonstrate a significant difference.14,15 Results from a study on the efficacy of a novel brush head design demonstrated that a brush with angled bristles was more effective in plaque removal when compared to brushes with crisscross bristles, standard straight bristles and a battery powered brush.16 A study of five advanced manual toothbrush designs (3 crisscross bristle designs and 2 standard straight bristles) concluded that while all were highly effective in plaque removal, the crisscross designs showed a consistent advantage in efficacy, indicating that the crisscross design can further enhance plaque removal.17 The wide variety of available designs in manual toothbrushes points out that dental professionals and toothbrush manufacturers are consistently searching to find more effective designs for plaque removal. 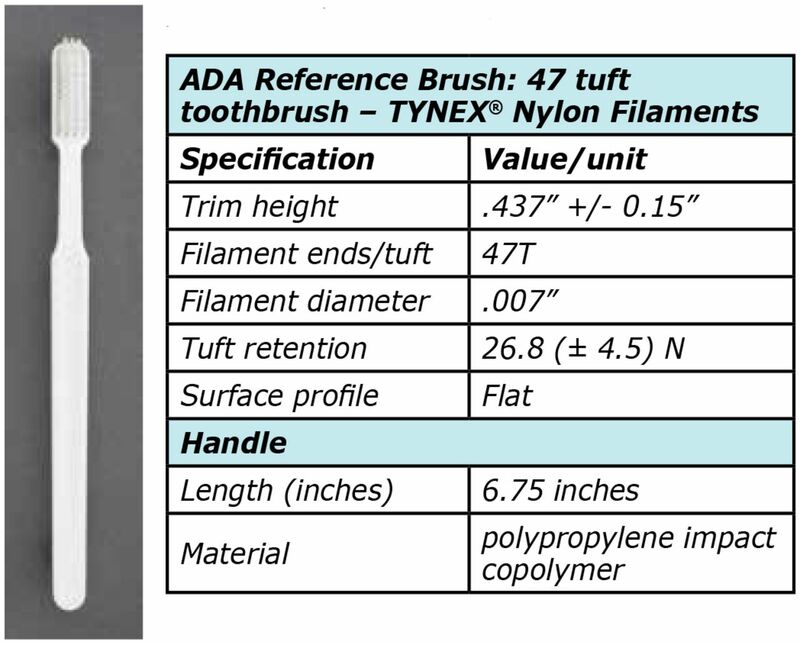 A novel manual toothbrush (MD Brush™; M Davidson, Pearland, TX), as shown in Figure 1, is designed with a patented four-surface grip handle and an angled brush head featuring W-cut tapered bristles (Figure 2).22 The brush handle to head orientation is specifically designed to aid the user in achieving the recommended 45-degree angulation of the Bass technique and includes a visual reference on the end of the handle, which when viewed in the mirror, indicates proper bristle adaptation (Figure 3). A common method for evaluating the efficacy of a new toothbrush design is to compare it to a standardized toothbrush. The American Dental Association (ADA) offers a reference toothbrush with a straight handle and a flat brush head with rounded bristles which is used specifically for toothbrush research. 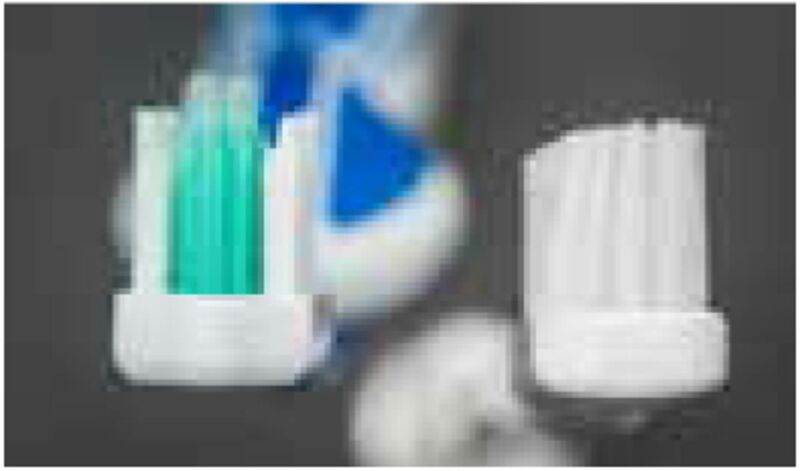 (Figure 4)7, 8, 15, 23 A side by side comparison of the novel brush and the ADA reference toothbrush is shown in Figure 5. This novel brush is new to the marketplace and its efficacy has not been reported in the literature. The purpose of this pilot study was to investigate the plaque removal efficacy of the novel brush as compared to the ADA reference toothbrush by assessing the pre-and post-brushing plaque indices in a study population. Furthermore, a qualitative survey was used to investigate the participants' perceptions of the novel brush and the ADA reference toothbrush. A convenience sample of 38 first year dental hygiene students participated in the study. Inclusion criteria were: five evaluable teeth in each quadrant (excluding all third molars and all central incisors); abstinence of using any outside oral hygiene products during the study period; no professional prophylaxis during the study period; and abstinence of any oral hygiene care and procedures for twenty-four hours prior to data collection. Third molars (teeth numbers 1, 16, 17 & 32) were excluded from analysis due to their absence in a number of subjects. Central incisors (teeth numbers 8, 9, 24 & 25) were excluded due to the tendency for over-lapping adjacent quadrants during brushing. Informed consent was obtained from the volunteer subjects and each participant was assigned an identification number for confidentiality. Institutional Review Board approval was obtained from the University of Texas Health Science Center at Houston (UTHealth) School of Dentistry for the study. In order to familiarize participants with both study toothbrushes, participants were given the novel brush (MD) and an ADA reference toothbrush (ADA), in addition to a tube of toothpaste. A non-antimicrobial, non-fluoridated toothpaste (Tom's of Maine™ Natural Toothpaste; Colgate-Palmalive, New York, NY) was chosen as a control for confounding variables. 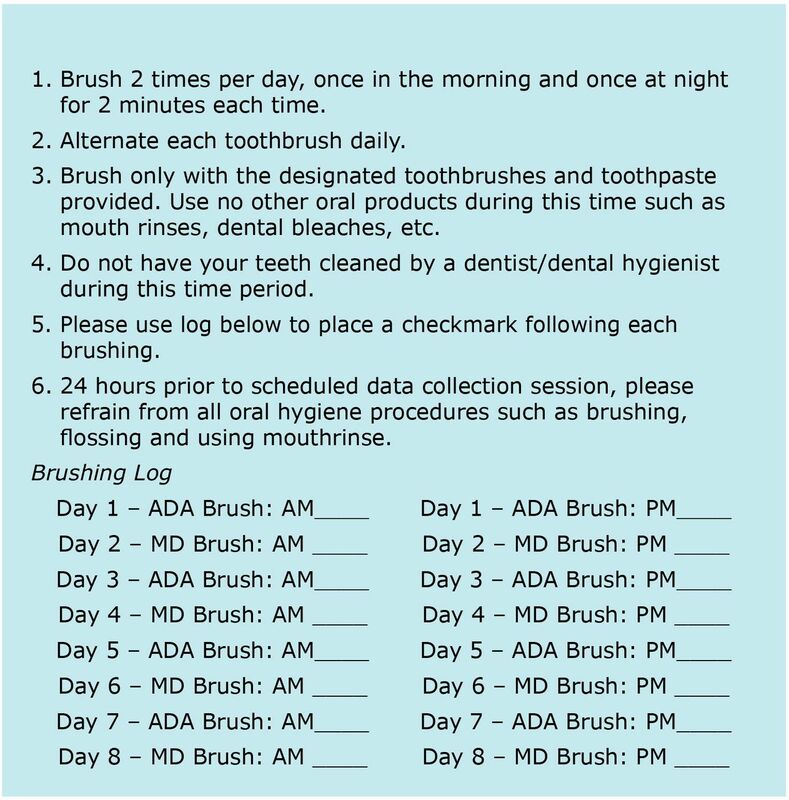 Study participants were asked to brush twice a day with each of the prescribed brushes and toothpaste, to be used on alternate days for a total of eight days prior to the data collection session. All participants received detailed brushing instructions and a brushing log (Figure 6). Participants were randomly assigned to one of two groups and given one MD and one ADA brush as they presented for the data collection session. The data collection sessions began with a baseline plaque record performed by a calibrated examiner using the O'Leary Plaque Control Record Index,25-27 to note the presence or absence of plaque on six surfaces of each tooth: mesiolingual, distolingual, mesiofacial and distofacial. Disclosing swabs (HurriView™; Beutlich Pharmaceuticals, LLC, Bunnell, FL) were used to locate the presence of plaque. Study participants then performed timed brushing with the MD and ADA brushes: Group A brushed first with the ADA in the two left-side quadrants for 30 seconds each with 15 seconds for facial and 15 seconds for lingual surfaces; the right-side quadrants were brushed next with the MD, using the same timing criteria. Group B brushed first with the MD in the left-side quadrants for 30 seconds each with 15 seconds for facial and 15 seconds for lingual surfaces; the right-side quadrants were brushed next with the ADA, using the same timing criteria. Toothpaste was not used for the timed brushing. Randomized group assignments and timing were supervised by a calibrated research assistant. A final, post-brushing O'Leary Plaque Control Record was obtained from the same examiner who was blinded to the group assignments. All plaque scores were recorded in the Electronic Health Record (EHR) and transferred to Excel files for data analysis and source documentation. The plaque scores were deleted upon completion of the data analysis from the EHR. Participants were also asked to complete a qualitative survey assessing the two toothbrushes. The anonymous paper survey was completed by each participant in a semi-private area away from the examiner and research assistants. All statistical analyses were performed using SAS version 9.3 for Windows. Descriptive statistics of the number of subjects, mean, and standard deviation were computed for various sets of surfaces described in the results. The plaque score was the percent of surfaces with plaque for each individual and each area of the mouth being considered. The group means of the plaque scores were compared in the statistical analysis. The means (SD) proportion for the ADA group and the MD group are shown in Table I. A repeated measure, mixed model analysis was used to check for order effects of the brushes and balance for any such effect when comparing the brushes due to the split-mouth, crossover design. Two-way interactions were tested when analyzing the overall effects as well as effects in smaller areas of the mouth. Baseline plaque scores for each analysis were used as a covariate to adjust for any differences in brush comparisons. Pairwise, least significant difference t-tests were used following the mixed model ANOVA. Of the 38 enrolled subjects, all 38 completed the protocol. Data displayed in Table I shows that there were no statistically significant differences found between the novel brush and the ADA reference brush when comparing overall plaque score changes from baseline to post-brushing (ADA, -0.28 and MD, -0.27). Both brushes significantly reduced plaque (p<0.0001) overall; in the mandible on interproximal surfaces and on smooth surfaces; in the maxilla on facial and lingual surfaces. Comparisons of all interproximal sites (ADA, -0.23 and MD, -0.21), all smooth sites (ADA, -0.36 and MD, -0.37) and comparisons of left (ADA, -0.22 and MD, -0.16) versus right sides (ADA, -0.23 and MD, -0.27), also showed no statistically significant differences in baseline to post-brushing plaque scores of the two brushes. However, both the ADA and MD showed greater improvements on the right side (p=0.0095) for interproximal surfaces and the left side for smooth surfaces (p<0.0001). Further analysis compared the mandible to the maxilla and facial versus lingual surfaces (Table I). Both brushes were significantly better at removing plaque in the maxilla (p<0.0001) as compared to the mandible. In addition, the ADA was shown to be slightly more effective than the MD at removing plaque in the mandible (ADA, -0.29 vs MD, -0.21, p=0.0222) and on the lingual surfaces (ADA, -0.27 and MD, -0.21, p=0.0169). Both brushes were more effective on facial surfaces compared to lingual surfaces (p<0.0001). The survey results (Table II) showed that 63% of study participants used a manual toothbrush, while 39% used a power brush for their daily brushing prior to the study. Several participants checked both categories which accounted for the >100% total. Four different brands of manual brush and two brands of power brush were named. A Visual Analog Scale (VAS: 1-10) was used for the remaining survey questions. Results showed that there was a significant difference in favor of the MD over the ADA in satisfaction with the toothbrush. A significant difference was also shown in how clean the teeth felt to the participant after brushing with each brush, with the MD the preferred brush. When asked how likely they would be to purchase each brush in the future, a significance difference was shown in favoring the MD product. Participants' comments were categorized according to their written answers (Table III) on the following most common factors: bristles; handles; size; effectiveness; and no specific likes or dislikes. Answers given with the higher percentages were: handle design of MD liked most (53%); bristles of ADA liked least (47%); nothing liked about ADA (37%); handle of MD liked least (34%); bristles of MD liked most (34%); and bristles of ADA liked most (32%). The most frequent positive remarks were pertaining to the handle design of the MD. In the category of least liked characteristics, the bristles of the ADA were commented on most frequently in addition to the handle of the MD. Manual toothbrushes are commonly used for plaque control. Brushing technique, duration and the brush itself have been identified as important factors for effective plaque removal.15 This cross-over split mouth study design was chosen in order to have each subject act as his/her own control by using each study brush in opposite sides of the mouth, thus eliminating the factor of one subject's brushing technique being superior to another.7 The timed brushing sessions removed the possibility of one subject brushing longer than another. By eliminating the factors of technique and duration, this study focused on the plaque removing ability of the brush itself. Baseline plaque scores (all>90%), indicate that the study subjects had been compliant with the stipulation to abstain from all oral hygiene procedures 24 hours prior to data collection. Plaque scores collected at baseline as compared to post-brushing plaque scores were overall -0.27 (p<0.0001). Considering technique and duration were not factors in these differences, both brushes removed less than 30% of the total plaque present at baseline, even though brushing was performed for a total of two minutes. Similar findings have been reported in comparable toothbrush studies showing no superior toothbrush design.15 While manual toothbrush studies most commonly indicate a 40-55% plaque removal rate, others have reported 26-39% efficacy, similar to the results of this study.15 Unlike previous studies reporting that angled bristles were superior to flat uniform height bristles, these findings were not replicated in this study. Thirty-seven out the thirty-eight study participants were right-handed. Due to the split mouth study design, right versus left-handedness did not appear to have impacted the overall comparative results. Both brushes performed better on the left side for smooth surfaces; however, both brushes performed better on the right side for the interproximal surfaces. Left and right sides were significantly different for the interproximal and smooth surfaces; however, both brushes were equally effective on the right and on the left. Contributing factors acting as barriers to more effective plaque removal may have been poor brushing skills and the presence of the timing research assistant during the brushing phase. Additionally, toothpaste was not used during the data collection, which might have affected the subject's brushing technique, although toothpaste was not used with either toothbrush. There may be other factors involved in superior plaque removal beyond toothbrush design. Instruction and motivation from an oral health professional may play a pivotal role in effective plaque removal. Other confounding factors may have been that all subjects were exposed to the same lecture on tooth brushing methods several days prior to the data collection session, which may have impacted how both study brushes were used. In addition, the MD packaging contained information on the Bass method of brushing and subjects had the opportunity to go to the manufacturer's website for further informational videos. The exposure to additional information and instruction factor could have influenced how either brush was used, although neither brush in this study demonstrated superior plaque removal. This was a pilot study of a newly designed and marketed toothbrush and, as such, presented limitations. Time limitations during the first semester of the dental hygiene program allowed for only one data collection completed during week three of the semester. Prior knowledge of tooth brushing methods may be attributed to the fact that a portion of the study population had been previously employed as dental assistants. The study's small sample size of dental hygiene students was not representative of the general population. Future research of this novel brush should be conducted using a larger population sample over a longer duration (>6 months) with a cross-over study design that includes a wash-out period. Additional studies could also assess the impact of the educational literature and online instructional videos provided by the manufacturer of this novel brush on the Modified Bass brushing method. Utilizing a broader sample from the general population rather than future dental professionals may provide greater insight on the plaque removal effectiveness of this novel toothbrush. Differences between baseline and post-brushing plaque scores showed that both brushes were effective in plaque removal producing similar overall results. The ADA reference toothbrush was slightly more effective in plaque removal than the novel brush in the mandible and on lingual surfaces throughout the mouth. No other significant differences were found between the two study brushes in effectiveness of plaque removal. Survey results found that the novel brush was well received, with subjects significantly more pleased with its overall use and sense of a cleaner feel. Subjects were significantly more likely to purchase the novel brush in the future, with the handle design receiving the highest number of positive comments. The authors extend special thanks Krishna Kumar Kookal, MS for his assistance in organization of the data for analysis and The University of Texas Health Science Center at Houston (UTHealth) School of Dentistry Dental Hygiene Class of 2017 for their participation. Ruth E. Conn, RDH, MSDH is an assistant professor at the University of Texas, UTHealth School of School of Dentistry, Department of Periodontics and Dental Hygiene, Houston, TX. She completed this research as a part of her graduate studies at the University of Texas Health Science Center in San Antonio; Donna Warren-Morris, RDH, MEd is a professor and dental hygiene program director at University of Texas, UTHealth School of School of Dentistry, Department of Periodontics and Dental Hygiene, Houston, TX; Tom Prihoda, PhD is a professor of pathology; Beatriz M. Hicks, MA, RDH is a clinical associate professor and Emelda E. Hernandez, RDH, MS is a clinical assistant professor; all at the University of Texas, UT Health San Antonio School of Dentistry, Department of Periodontics, Dental Hygiene Division. This manuscript supports the revised NDHRA priority area: Client level: Oral health care (new therapies and prevention modalities). Funding for this research was obtained from Michael Davidson, owner, MDBrush, LLC.
. Experimental gingivitis in man. J Periodontol. 1965 May; 36(3):177-187. (eds). Dental plaque control measures and oral hygiene practices: Proceedings from a state-of-the-science workshop. Irl Pr. 1986;93-116.
. Laboratory evaluations of a bi-level, extremely tapered bristled toothbrush and a conventional uniform bristled toothbrush. Am J Dent. 2009 Apr;22(2):84-8.
. Clinical comparison of the plaque removal efficacy of a manual toothbrush with criss-cross bristle design. Am J Dent. 2009 Aug;22(4):200-202.
. Plaque removal efficacy of a novel manual toothbrush with MicroPulse bristles and an advanced split-head design. J Clin Dent. 2006 Dec;18(2):49-54.
. Interproximal access efficacy of three manual toothbrushes with extended, x-angled or flat multitufted bristles. Int J Dent Hygiene. 2010 Aug;8(3):244–248.
. Safety and efficacy of two manual toothbrushes. Int J Dent Hygiene. 2010 Nov;8(4):280-285.
. Clinical efficacy of two toothbrushes with different bristles. Int J Dent Hygiene. 2007 Nov;5(4):242–246.
. Comparison of manual toothbrushes with different bristle designs in terms of cleaning efficacy and potential role on gingival recession. Eur J Dent. 2014 Jul;8(3):395-401.
. Comparison of plaque removing ability of one standard and two flexible-head toothbrushes. J Dent Hyg. 2004 Apr;78(2):340-342.
. A laboratory based investigation of a new elastic toothbrush head. ScientificWorldJournal. 2014 Nov 18;2014.
. Replicate single-use comparative study of plaque removal with two contemporary manual toothbrushes. Am J Dent. 2009 Jun;22(3):189-192.
. Improved plaque removal efficacy with a new manual toothbrush. J Contemp Dent Pract. 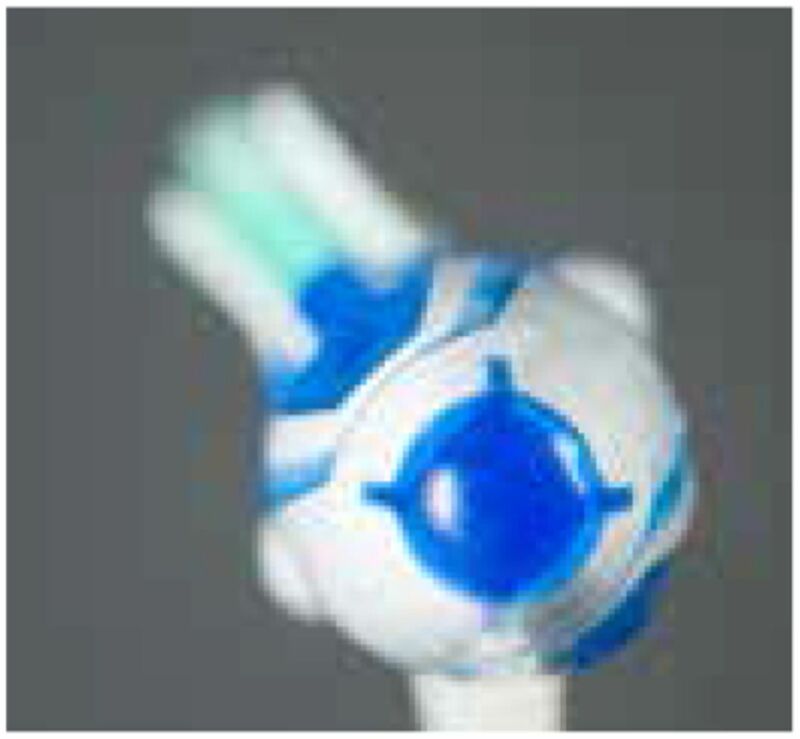 2008 May;1(9):1-8.
. Blinded clinical evaluation of a new manual toothbrush. J Clin Dent. 2006;17(1):1-4.
. Clinical evaluation of brushing time and plaque removal potential of two manual toothbrushes. Int J Dent Hygiene. 2008 Nov;6(4):321-327.
. Plaque removal efficacy and safety of the next generation of manual toothbrush with angled bristle technology: results from three comparative clinical studies. Am J Dent. 2005 Feb;18(1):3-7.
. A clinical evaluation of the plaque removal efficacy of five manual toothbrushes. J Clin Dent. 2010;21(1):8-12.
. An analysis of methods of toothbrushing recommended by dental associations, toothpaste and toothbrush companies and in dental texts. Br Dent J. 2014 Aug;217(3):E5.
. Clinical Practice of the Dental Hygienist. 11th ed. Baltimore, MD. Lippincott Williams and Wilkins. 2013. 1264 p.
Getting a new product to market. Access. 2015 May-Jun;29(5):18-22.
. Laboratory inter-proximal access efficacy and gingival margin cleaning of the elmex® sensitive soft, extra soft and ADA reference toothbrushes. J Clin Dent. 2007 Dec;18 (1):1-4.
. A systematic review of the effectiveness of self-performed mechanical plaque removal in adults with gingivitis using a manual toothbrush. J Clin Periodontol. 2005 Oct;32(Suppl.6):214-228.
. The plaque control record. J Periodontol. 1972 Jan;43(1):38-38.
. The Bass technique using a specially designed toothbrush. Int J Dent Hygiene. 2008 Aug;6(3):183-187.
. A comparison of powered and manual toothbrushes in controlling plaque and gingivitis: A clinical study. Clin Cosmet Investig Dent. 2013 Jan;5:3-9.